These USB ports arenвЂ™t easy to work with and are too close to each other, making it impossible to plug in two large devices at the same time. Besides them, the back panel quite appropriately carries a power connector and a video output. Besides it, there are LAN and modem ports, a card reader and an ExpressCard/34 slot there. 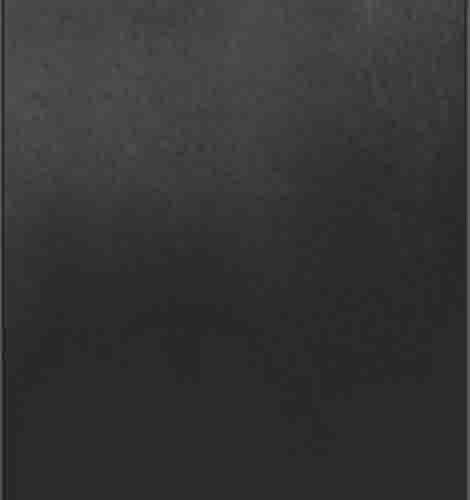 The slot is two times narrower than ordinary ones, but it doesnвЂ™t matter much because there are still no peripherals for this as well as for normal-size ExpressCard slots. The LW40 comes with a high-quality card-reader which supports xD format among everything else вЂ“ recommended for owners of Olympus cameras! 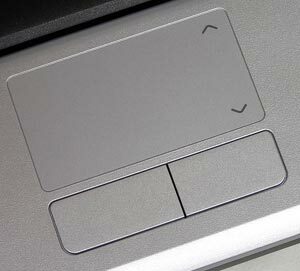 There are no reduced-size keys here; the arrow keys are separate from the rest of the keyboard. A special row of keys for text navigation is available. The only small problem is that the brightness adjustment keys are in the right part of the keyboard making it impossible to adjust this setting with only one hand. 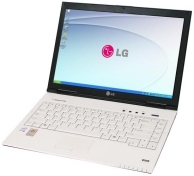 Some user may also find the special solution from LG вЂ“ combining Insert and Delete in one button вЂ“ inconvenient. ThereвЂ™s nothing superfluous here вЂ“ just two keys and a vertical scrolling zone вЂ“ but it is a real pleasure to use this touchpad. ThereвЂ™s a fashionable glossy coating on the display but its parameters are not very good: a not very high maximum of brightness, average viewing angles and average response time. The color reproduction is quite good, though. 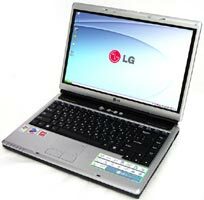 You shouldnвЂ™t take this too seriously because such drawbacks are typical to some extent of all the participating models and even of all notebooks at large. 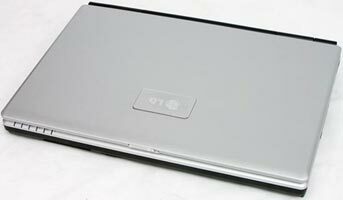 The LW40вЂ™s display is good enough for work in office applications and watching video. 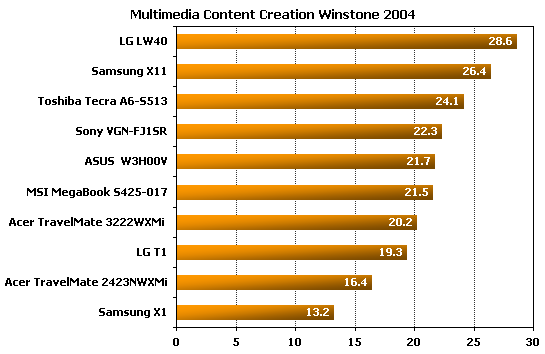 So, the LW40 isnвЂ™t going to give up its market positions. Combining an adequate price with good quality, it is the companyвЂ™s main offering in this sector вЂ“ the competitors are challenged to beat this combination if they can. 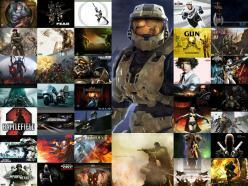 You should definitely put this one into your вЂњto considerвЂќ list. 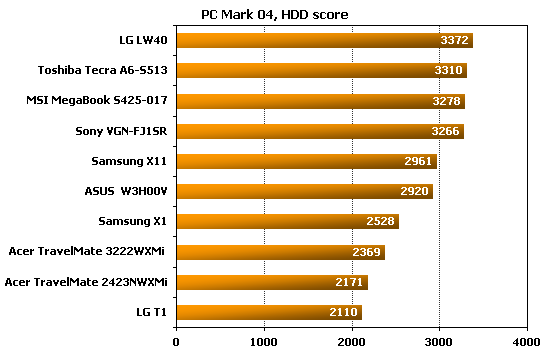 The well-balanced LW40 is almost as fast as the two notebooks on the new platform. 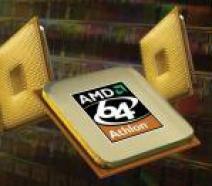 Other notebooks are slower. The two slowest models shouldnвЂ™t be used to run such applications at all вЂ“ they are only capable of performing office tasks like processing text and spreadsheets, browsing the Web, etc. 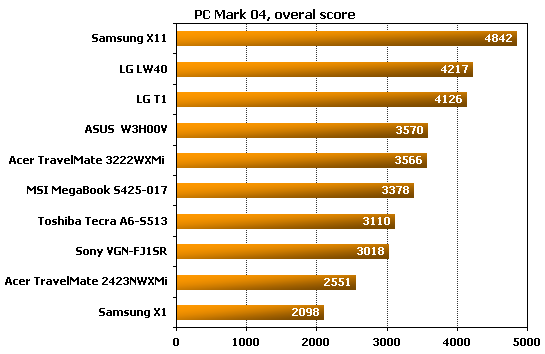 performed this test using the maximum display resolution of each notebook, except for the LG T1 (I used 1280x800 with it because 1440x900 would have been too much for its integrated graphics core). The Acer TravelMate 3222WXMi is the best and can cope with modern games if you donвЂ™t use the highest graphics quality settings. 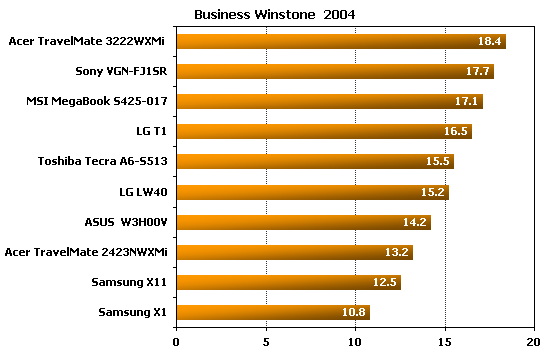 Among other notebooks, only models with the X600 are interesting. 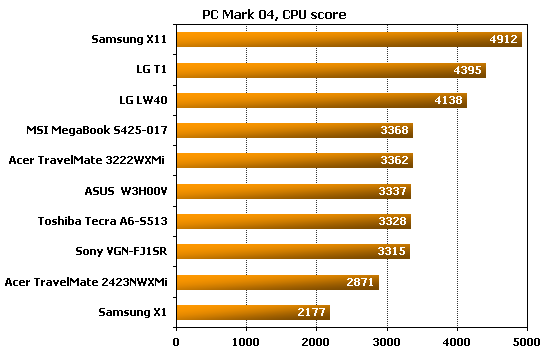 The Samsung X11 is second after the TravelMate 3222WXMi but I doubt itвЂ™s going to be that fast in real games. 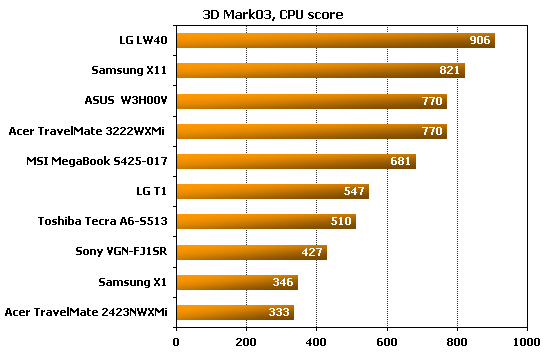 I also published the results of the CPU subtest to show you that 3DMark03 favors the Centrino Core Duo platform. 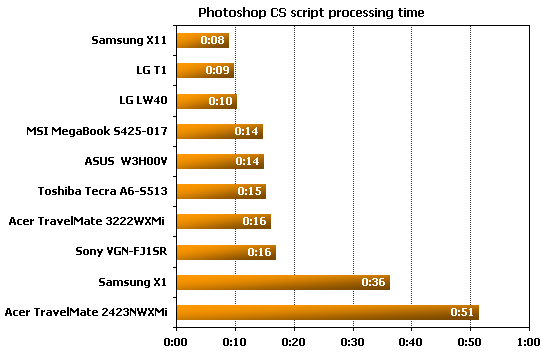 This is indicated by the Samsung X11вЂ™s results. 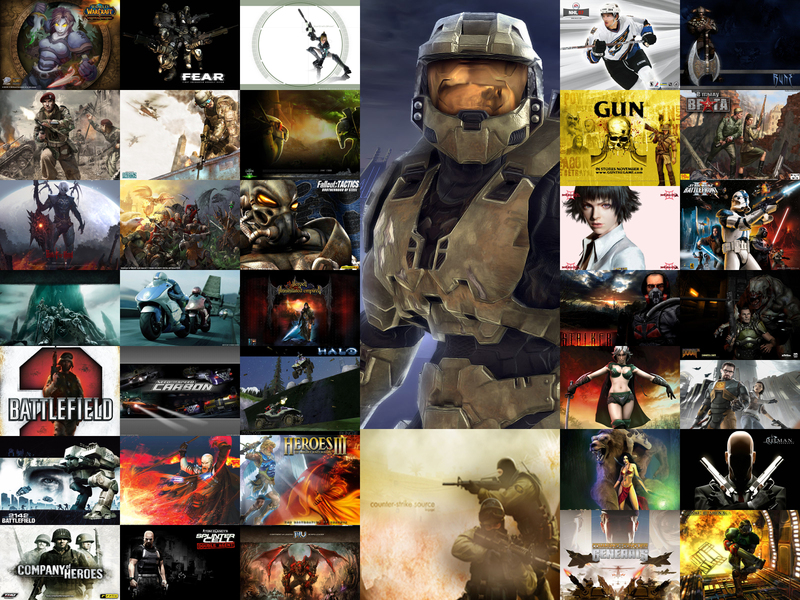 This platform is the most promising one when it comes to games, considering that all the leading game developers have confirmed support for dual-core processors in their upcoming products. 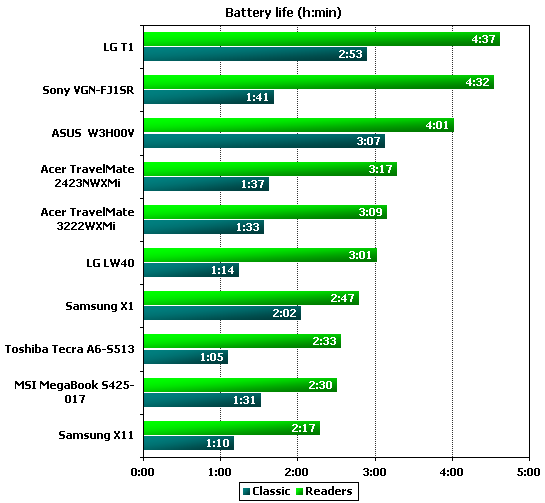 I put the results the notebooks achieved in ReaderвЂ™s mode and under maximum load into one diagram because the difference between the two is indicative of how well the manufacturer set up the power-saving parameters. The Sony VGN-FJ1SR looks best here as it yields you its full computing power under max load but is very economical in ReaderвЂ™s mode. 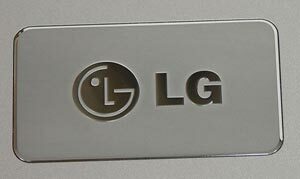 Besides the Sony, there are two more leaders: LGвЂ™s T1 with a high-capacity battery and an L series Core Duo processor which features low power consumption, and ASUS W3H00V. The latter proved to be a bit of a cheater, though. Even under max load with the portable/laptop power management scheme selected this notebook never increased its CPU frequency higher than 1.3GHz. ItвЂ™s all clear with the first two diagrams, but then there are some things IвЂ™d want to single out. 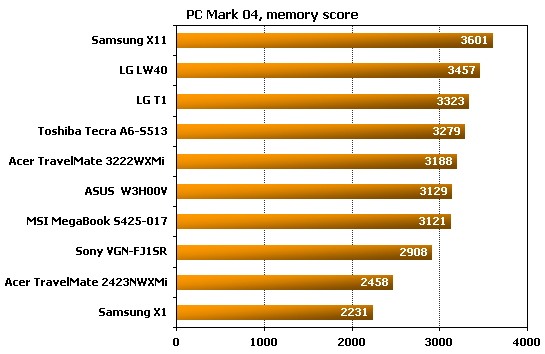 The LW40 is very fast in the memory test; itвЂ™s the best Centrino-based notebook IвЂ™ve seen in this benchmark. 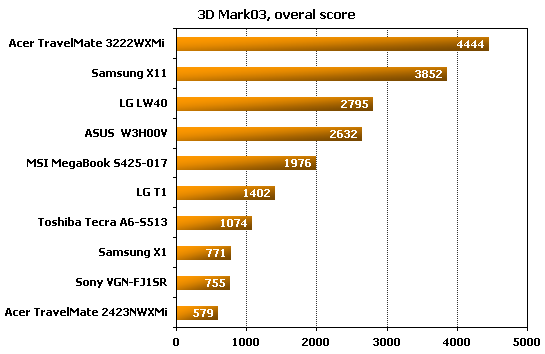 The Acer TravelMate 3222WXMi is unrivalled in the graphics subsystem test just because it has the fastest graphics adapter among the tested notebooks. 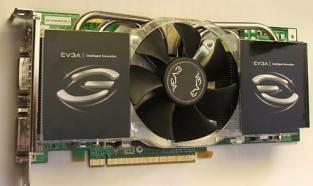 NvidiaвЂ™s GeForce Go 7400 is downright disappointing. If you need fast graphics, buy a notebook that has dedicated graphics memory. 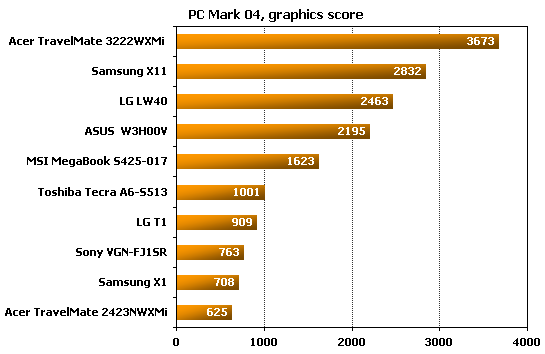 Graphics subsystems of other kind (with such suffixes as TC, HM) are not much better than integrated graphics and cannot ensure high performance in 3D. In the disk subsystem test the notebooks rank up according to the spindle rotation speed of the hard drive they use.